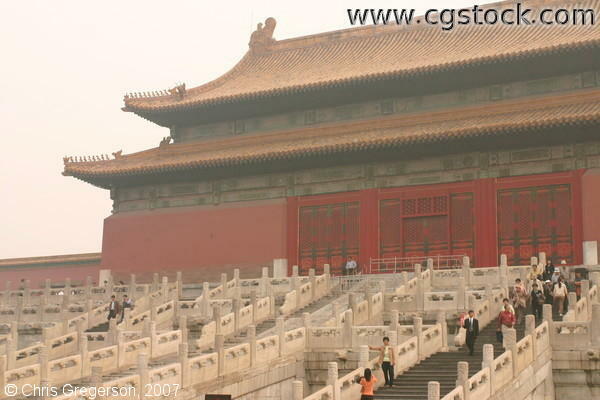 This is the back of the building known as the The Hall of Preserving Harmony (BaoHeDian). It served various purposes in each dynasty. During the Ming Dynasty, for instance, it was used by emperors as a place to practice their speeches, change their clothes, or for ceremonies such as the conferring of the title Empress or Crown Prince. Meanwhile, during the Qing Dynasty, banquets in celebration of a princess�s marriage, New Year�s Even, or to honor officials, were done here. It was also in this building where the emperors would announce the top 10 students who passed the Palace Examination.